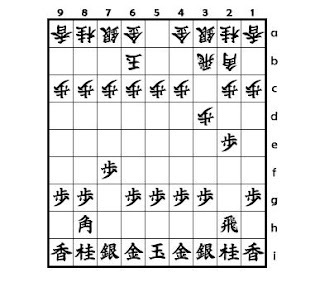 Yamajunn's Shogi opening traps: Niteme San-Ni Hi senpou , part 2. Niteme San-Ni Hi senpou , part 2. 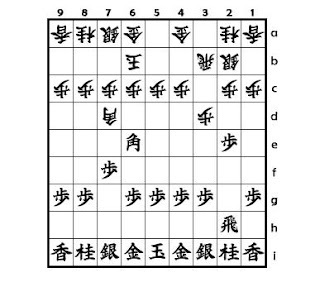 Shogi Opening traps : Niteme San-Ni Hi senpou , part 2. In this time , Sente tries to make a promoted Bishop with B*6e after Bishop exchange , because Sente can't break Gote's 2nd file . 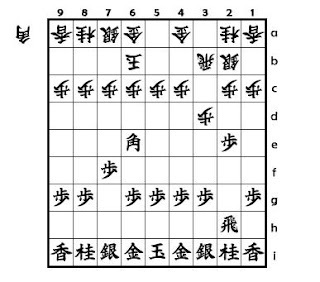 In the diagram 2 Gote can't protect both 8c and 4c Pawns , and Sente can promote the Bishop . So Sente seemes to get advantage . How Gote should play ? Gote drops a Bishop , he protects 8c file and he also aims to make promote his Bishop in 4th file with Bx4g+ . (1) Sente exchanges the Bishops again with Bx7d . (2)Sente makes promoted Bishop with Bx4c+ . Both lines have difficult variations .